We've had this one circled on our calendars for a while now: The Humans, winner of the 2016 Tony Award for Best Play, is now officially in production at The Rep. 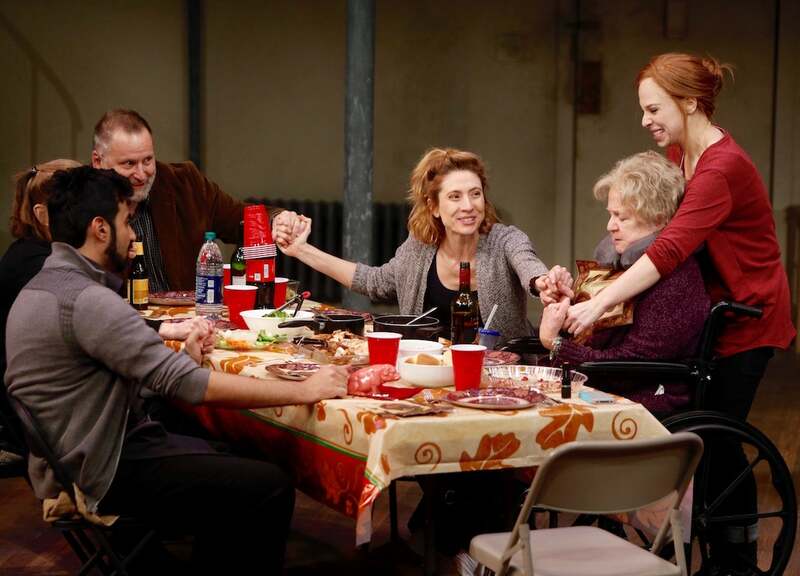 The play puts a middle-class family under the microscope as they reunite for Thanksgiving in a dingy and somewhat peculiar New York apartment. The Blakes are all dealing with life's indignities in their own ways, and the way they collide and bounce off one another creates an utterly entrancing theatre experience. 1.) Characters are always talking – and always listening. Director Steven Woolf compared the show to a Robert Altman film, with the director's famed use of overlapping dialogue a strong touchstone for Stephen Karam's script. In the script itself, those moments of overlap are marked with a slash ("/"), which gives the actor with the next line of dialogue his or her cue to start speaking before the other character finishes. When done well, this style of writing creates a naturalistic flow of dialogue that hops freely between topics and characters. And believe us, our cast is already excelling with this material (more on them later). In addition to the near-constant din of familial conversation, Woolf noted that non-speaking characters are almost always listening in to what someone else is saying. The walls of the apartment where the play takes place are notoriously thin, which creates opportunities for characters to unexpectedly overhear a conversation from another room. And that only adds to the dramatic tension that grows throughout the play. Set model, designed by Gianni Downs. 2.) This would easily be the biggest apartment in New York City. If you've ever occupied or visited an actual New York City apartment, you'll probably have to suspend your disbelief at the size of our set. Cast member Fajer Kaisi joked that it's basically "the Friends apartment," which was infamously oversized by Big Apple standards. The set (designed by Gianni Downs) features two floors, connected by a spiral staircase, with sparse furniture and off-white paint adorning the walls. The Blakes' youngest daughter, Brigid, has just moved in here with her boyfriend Richard, giving an "under construction" feel to both floors. 3.) There are supernatural elements all over the fringes of the play. "The might feel like an episode of Twin Peaks," Woolf said at first rehearsal. It's a pretty apt description of how the supernatural works its way into the show: there are no actual ghosts or monsters lurking in closets, but there's a persistent element of the uncanny that haunts the characters and the apartment where they've gathered. In fact, Karam's script begins by quoting Sigmund Freud's definition of the German word for uncanny, "unheimlich." "What is 'uncanny' is frightening precisely because it is not known and familiar," Freud wrote. Unexplained noises, eerie shadows, the half-glimpsed forms of neighbors... all of these elements combine to create a simmering sense of unease and dread. It's the perfect backdrop for the themes that Karam wanted to explore in the play. "I think the play is really interested in how do we get up and move through our days, even with these big, existential horrors always kind of hanging over our heads?" Karam said in an NPR interview. 4.) The costumes will continue to evolve throughout rehearsal. Costume designer Dorothy Marshal Englis (who also designed Hamlet and The Marvelous Wonderettes for us this season) admitted that this show threw her for a bit of a loop: there was no color palette, no period, no frills: just functional clothes worn by regular people. So her costume sketches for the show have skewed a bit on the general side, allowing for customization as rehearsals progress. To that end, our costume team has pulled hundreds of items from our stock, which we'll add and subtract in search of the best look for each character. This is becoming a bit of a cheat – we lovingly praise the cast just about every time we do one of these reports. But let's reiterate – The Rep works with some of the theatre world's best performers. This particular group features some strong candidates for a hypothetical Rep Actor Hall of Fame. Let's start with Brian Dykstra, who plays family patriarch Erik Blake. He's only appeared in a handful of Rep shows, but he's made every one of them count. That includes larger-than-life turns as Lyndon B. Johnson in All the Way (2015) and Mark Rothko in Red (2011). Carol Schultz plays Erik's wife, Deirde, and this is her 16th Rep production. Darrie Lawrence plays the dementia-suffering grandmother, Momo, and this is her 15th Rep production. Kathleen Wise (Aimee) returns from our Curious Incident cast, while Lauren Marcus (Brigid) and Kaisi (Richard) make their Rep debuts. Beyond the pedigrees that these cast members bring, it was amazing to see them already acting like a family at the first script read-through. Regardless of whether they've worked together in the past, they've got a natural group chemistry that is really going to take this production to the next level.